SOURCE: Frank Taussig, Principles of Economics, Volume II, 1911. Pages 299-300. As with legislation on hours, factory conditions, and the like, a compulsory minimum wages rate might serve simply to regulate the plane of competition. All employers would be affected alike; no one could undersell the others by cutting below the established rate. There would be obvious difficulties of administration, — attempts at evasion, to be met only by a staff of inspectors, by publicity, by support from public opinion. Such difficulties, serious anywhere, would be especially serious in a country like the United States, whose methods of legislation and administration are still crude. But they involve no new questions of principle. A more fundamental question, yet still not one of an essentially novel sort, would be, how to deal with the unemployable. There would unfailingly be a certain number not capable of earning the minimum, — the aged, feeble, maimed, the dissolute or half dissolute. It would be impossible to compel employers to pay the minimum to those whose services were not worth it. But it is a fair question whether it is not a merit in the proposal, rather than a defect, that the community would be compelled to face squarely the problems of decrepitude and degeneration. 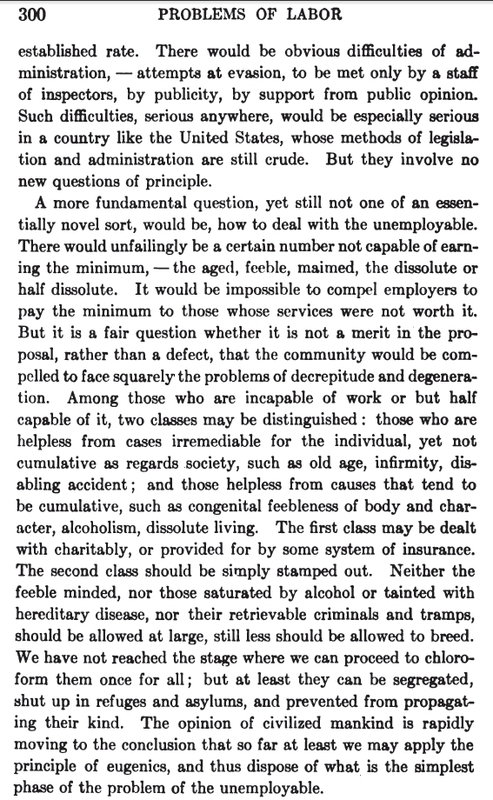 Among those who are incapable of work or but half capable of it, two classes may be distinguished: those who are helpless from cases irremediable for the individual, yet not cumulative as regards society, such as old age, infirmity, disabling accident; and those helpless from causes that tend to be cumulative, such as congenital feebleness of body and character, alcoholism, dissolute living. The first class may be dealt with charitably, or provided for by some system of insurance. The second class should be simply stamped out. Neither the feeble minded, nor those saturated by alcohol or tainted with hereditary disease, nor their retrievable criminals and tramps, should be allowed at large, still less should be allowed to breed. We have not reached the stage where we can proceed to chloroform them once for all; but at least they can be segregated, shut up in refuges and asylums, and prevented from propagating their kind. The opinion of civilized mankind is rapidly moving to the conclusion that so far at least we may apply the principle of eugenics, and thus dispose of what is the simplest phase of the problem of the unemployable.